Will Paul Conroy be jumping for joy on Sunday? 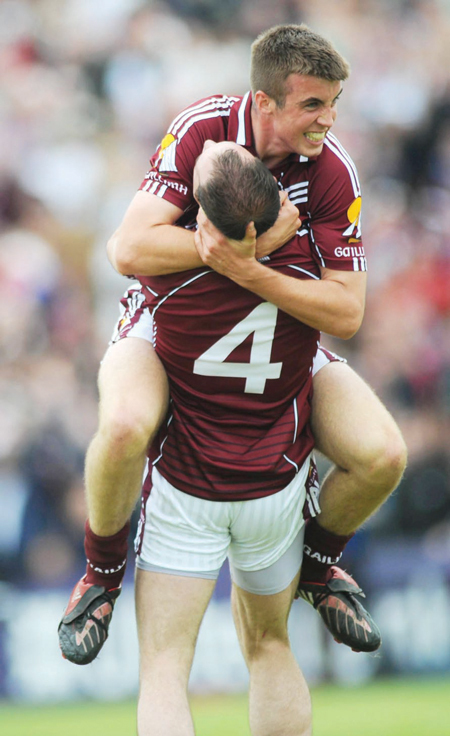 Pictured with Damien Burke, the two celebrate Galway’s victory over Mayo in 2008. Time moves swiftly at intercounty level. When a team is going badly, failing to get many championship outings and gone by early July year-in year-out, the summers trip over themselves. It does not seem that long ago that Paul Conroy was Galway's All-Ireland minor winning midfielder and captain. But that was in 2007, and next Sunday, he will be featuring in his sixth Connacht senior championship. The St James' man was promoted straight into the senior ranks by Liam Sammon in 2008, and he won his first (and only ) senior provincial medal that season. That August (2008 ) he was up against Darragh Ó Sé and Seamus Scanlon as Galway went down by five points (1-21 to 1-16 ) to Kerry in the legendary Saturday night monsoon at head office. It was a baptism of fire for any youngster, and despite that defeat, with u-21 successes from 2002, 2005, and the minor win in 2007 to build on, the future looked bright. Unfortunately it has not turned out quite like that. This Sunday is another chance to kick start an intercounty career that has stalled due to the lack of any real play time in late July or August. Conroy appreciates his career is moving on and he would love Galway to have a run in the provincial championship this year. "My first season at senior we played Kerry in Croke Park and put in a reasonable display. Despite that defeat, I was hopeful Galway would be coming out of Connacht on a regular basis. However, that has not happened. And our record in the qualifiers has been poor. Mayo have won three out of the last four Connacht titles, and have been by far the best and most consistent team in Connacht, so we know that they will be difficult to beat. "Our objective on Sunday is to try to produce a top-class team performance. For that to happen, we all need to try to win our individual battles. I have no doubt Mayo will be looking to try to go one better than last season. They will be very hard to stop, but it is a challenge we are looking forward to. If you don't believe your team can succeed, it won't. And we believe in ourselves." While Conroy made his name at underage as a top quality midfielder, he has been utilised in the main as a full-forward by Alan Mulholland over the past two seasons - a move he is happy with. "To be honest, I don't mind where I play. Full-forward took a bit of getting used to, but I am enjoying it there now and once I can do a job for the team I am happy enough. Fiontán Ó Curraoin, Niall Coleman, Tom Flynn, Anthony Griffin, Greg Higgins and a few others are vying for the midfield spots, so while it may be a cliché, I am happy to play anywhere once we are making progress and improving." After suffering six one-point defeats in the championship and qualifiers in the past four years, Conroy says he and some of the other more experienced players like Seán Armstrong, Finian Hanley, Gareth Bradshaw, Gary Sice, Colin Forde and Michael Meehan really need to put their shoulders to the wheel to get the team over the line in tight games. "The facts don't lie. And we have been beaten by a single point far too often in the championship since we lost the Connacht final to Mayo back in 2009. Our job is to try to change that. To be honest, we have no interest in looking backwards, and next Sunday is all we are focusing on." Away from football, Conroy is focusing on his final exams as part of the graduate diploma in education at UL. After a four year business degree in GMIT, he spent two years working as an SNA in his alma mater, St Mary's college, and he hopes to get a job teaching business subjects and Irish next September. However the spectre of emigration for teaching work looms large. "Many of my class have already sourced teaching jobs in England, Dubai and the United Emirates for next year. I would love to stay in Ireland for work and football with Galway and St James, but, you have to be realistic and you need to be working. "Over half my class of 50 students expect to have to go away for work this September. With the economic downturn and the way things have gone in teaching, young teachers have no option. It is not ideal, but what choice do people have?" For now though, the only thing on Conroy's immediate agenda is to try to get the better of the likes of Ger Cafferkey, Keith Higgins or Lee Keegan for 70 minutes next Sunday. "Mayo were the second best team in Ireland last year and held their own in division one this year too. They beat Dublin in the All-Ireland semi-final by three points and with a bit of luck could have taken Donegal last September. So it is pretty obvious from those results why they are hot favourites on Sunday. We are the underdogs, and rightly so. It is up to us to go out and produce a performance that we can be truly proud of. If we do that, the result will take care of itself." Page generated in 0.1399 seconds.